Do you have an old laptop that no longer works like it used to? With the correct Linux distribution, you can restore your old glory and enjoy it for a few more years as we told earlier. Hence, to help you get the most out of your old machine, we selected the 5 best Linux distro for old laptop. Many times we change computers taking another one, although it works perfectly, but falls short for today’s software. Many times it stays around the house without knowing very well what to do with it. The case: if it is capable of being turned on, know that you can install quite updated software (and not an operating system with thirteen years of age and without technical support). It is part of the magic of Linux-based OS: the kernel is very light, and it can work with very few resources (in terms of RAM and processor). It is enough to complement it with light but functional software. Let’s see 5 distributions of Linux ready to work on old computers but still have a war to give. Do you have an old laptop that no longer works like it used to? With the correct Linux distribution, you can restore your old glory and enjoy it for a few more years as we told earlier. 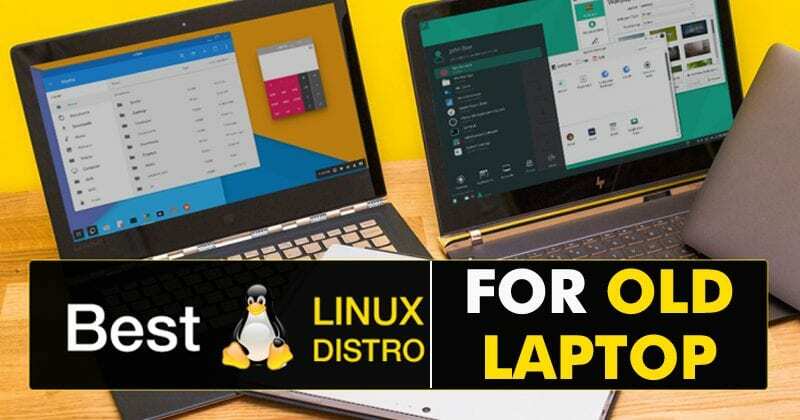 Hence, to help you get the most out of your old machine, we selected the 5 best Linux distributions for an old laptop. For many users, Linux is synonymous with Ubuntu. And many are already accustomed to the way of working in the distribution created by Canonical. Ubuntu, especially with Unity, is not made for old computers. But we have more flavors of this distribution, and one of them seems built thinking directly in this use. Its name is Lubuntu. The initial L comes from LXDE, the desktop environment used by default. And in fact, the initial L of LXDE comes from Lightweight. It is a desktop environment designed primarily to function in modest hardware. As a window manager, it uses OpenBox, a word that you will read a lot in this article because it is one of the fundamental components of many of these distributions. It also includes customized software and lighter than other alternatives. LXPanel, LXMusic, Leafpad and much more. Basically, this is a software that perhaps does not have all the features, but it does have the fundamentals which are enough for many of the users. Anyway, as usual, nothing prevents us from replacing these applications for which we want. What do we prefer Metacity (the default window manager used by the GNOME 2 desktop environment) to OpenBox? Just install it with the preferred package manager that’s it. The name of this distribution already evokes it. 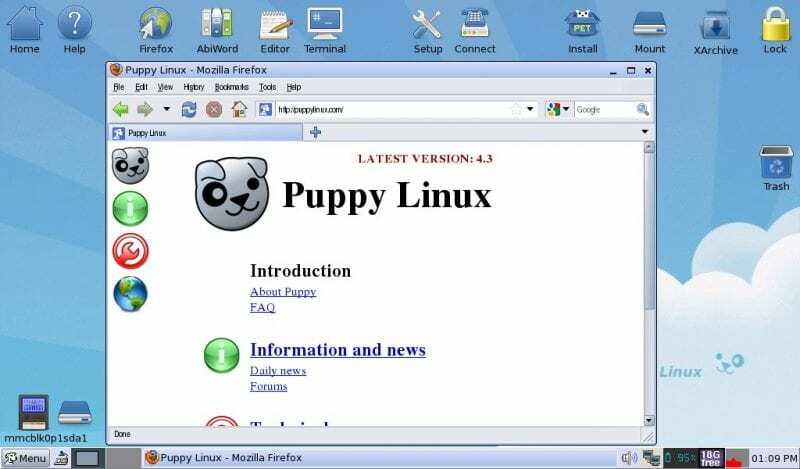 Puppy Linux already indicates from the beginning that it is a very light distribution designed to work everywhere. It has several versions, although the most updated (January 20, 2019) is compatible with Slackware, and therefore carries the prefix Slacko. Something quite striking is that by default it does not include an installation as we know it in other operating systems. This distribution starts directly to a desktop session ready to be used (although with some adjustment, such as the network connection that we are going to use). What we can save is the information of the session itself in the same unit from where we booted, or in a different one. We can run it, for example, directly from a USB drive on computers that do not have a hard drive or we do not want to touch it, and it continues to run without excessive slowdowns. Even with a couple of modifications, we could start our system from a local network, and store all the information on a different computer. As for its desktop environment, which is what the user interacts with on a daily basis, we find JWM (the J is from Joe, the name of its developer), used in modest equipment such as a Raspberry Pi. The minimum requirements, however, are somewhat higher than those of Lubuntu. We require a Pentium III or higher processor (should be clocked at 733MHz), as well as 256MB of RAM. Moreover, what is recommended is to have a 900MHz processor and 512MB of RAM. If we have a machine that is too old (of the first generation Pentium type, or even an i486), it may be worth sacrificing the latest software for having a functional machine. Damn Small Linux is the lightest distribution that we are going to talk about in this article, although at the expense of some functionality and the latest software versions. We speak of an ISO that occupies just 50MB, ready to save on an optical disk the size of a business card. We can also store it in a Compact Flash card, installing it in saving mode. What’s really interesting: Damn Small Linux requires, at a minimum, just one Intel 486DX (or an Intel 486SX with coprocessor for floating point operations) with 16MB of RAM. If we get 128MB, we can run the entire operating system from the main memory. 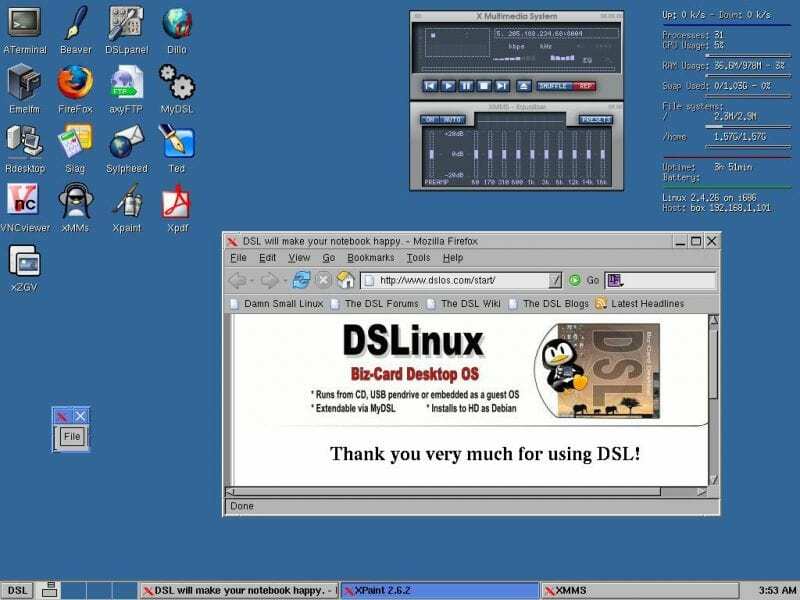 As a graphical environment and window manager, JWM proposes to us, like Slacko Puppy Linux, although in previous versions it used by default Fluxbox. It includes somewhat old versions of the basic software. To get an idea: Firefox 2, and kernel 2.4.31. Although it is still functional for certain tasks, despite the fact that we will have to install many pieces of software manually, we might expect, like some version of OpenOffice. In 50MB we can not ask for compressed Debian media, of course. Even lighter than we would expect, SliTaz proposes an ISO of just 40MB that allows us to start a fully functional system, or install it on a hard drive with barely 100MB of free space. It is a very light distribution and luckily brings us something more updated software (although we should not be surprised if we see still old versions by today’s standards). To contextualize: the latest version in development includes kernel 3.2.53. They are currently testing the Release Candidate of SliTaz 5.0. The development, as we can see, is very much alive and as a desktop environment, it offers us OpenBox. Minimum requirements? There is not much documentation about it, but a Pentium III with 256MB of RAM should work very smoothly, and with half of the main memory, it would be quite usable for less intensive tasks (the system takes for itself something less than 60MB). Arch Linux can be as compact and fast as you want. In fact, some Arch Linux users have replaced all graphical applications with their CLI equivalents to prove to themselves that beautiful icons and visual effects are overrated. Although it is unnecessary to say, an operating system without any graphical application can run on virtually anything, including your previous laptop as well. With Arch Linux, you have the freedom to create the operating system that best suits your needs, but you must be prepared to work. In Arch Linux, the Wiki is your best friend, since it explains everything from the installation of the distribution to its configuration. As we see, a computer is old is not an excuse to install relatively updated software and provide an extra time of life. We can take advantage of this kind of computers, for example, to be used as digital typewriters, to check email with a client such as Thunderbird, or to make light Internet browsing. It can also be coherent to use a lightweight distribution in a slightly more powerful device, above all in order to get the most out of our applications. This already depends on the skill of each one and the use that he/she will make for his/her machine. So, do not hesitate to propose any options if you have, as we will love and appreciate that if you will do it. What do you think about this? Simply share all your views and thoughts in the comment section below.